We create framed records of favourite songs.......We will frame a favourite vinyl single with a personalised engraved plaque to make a unique and original gift for a special occasion. Ideal for weddings, birthdays and anniversaries. Unlike some of our competitors, we provide you with the authentic, original vinyl record; not a replica!! As it's a bespoke product, delivery normally takes 5 to 7 days. Perfect Personalised Presents......Making the Past the Present!! 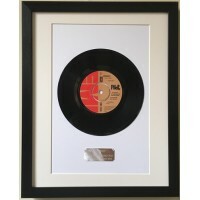 We create framed records of favourite songs.......A framed and mounted vinyl single&nbs..